Grapevine Lake is a relatively small 7,380 acre Corp of Engineer lake with 60 miles of shoreline just north of Dallas Fort Worth Airport. There are seven different parks for camping and/or day use. The lake is fairly shallow particularly at the north end and the shore line is sand/mud and rocks. If you have a boat, you can usually find some smooth water near the dam, at the northwest end of the lake (be carefully, it is shallow and has some tree stumps), or in some of the small coves. 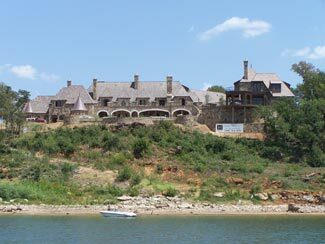 Cruise the north side of the lake and you'll see some magnificent and huge homes. The south side is not developed, except for the lake parks. At the southeast end of the lake is the Gaylord Texan hotel (you can see it but not get to it by water) and they are building (in mid 2006) a huge bar and restaurant on the shore. 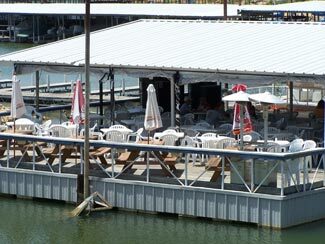 Some time during your cruise of Grapevine Lake you need to stop for lunch or dinner at Little Pete's which is in Twin Coves (middle part of the north side of the lake) at the Twin Coves marina. Little Pete's is open year round, has a family atmosphere, a sports bar with a big screen and 12 other TVs, 3 different dining areas, and a great deck on the water. They have live music on Friday and Saturday, acoustic on Thursday and Sunday, and other events. If you don't have a boat, you can rent a party barge, jet ski, pontoon boat, or large houseboat from Just for Fun to cruise the lake. Grapevine Ducks has amphibious tours of the lake departing from downtown Grapevine. When the water is down, like it was when these pictures were taken in 2006, you'll find some good sandy/muddy beaches and some islands to beach the boat and swim, fish, or chill out for a while. There are seven different parks on Grapevine, two of which (Twin Coves and Silver Lake) offer campsites with water and electricity and Oak Grove and Murrell Park have camping with no hookups. The Corp of Engineers is spending over $3 million in 2006 to expand and improve Murrell Park. 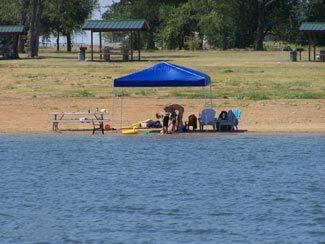 Texas Parks and Wildlife has a listing of the lake facilities, but it is a little dated and some of the names have changed -- call before you head out to the lake. Twin Coves is where Texas Outside always parks our rig for the weekend. It is a very clean campground, with a boat ramp, water and electric sites among the trees, and sites that are fairly close to the water. You can leave your boat in the water and sleep well at night because Twin Coves is fairly well protected. One of the other reasons we like Twin Coves is because it has easy access to the Northshore Trail for biking or hiking and it is in the same cove as Little Pete's -- you can walk or bike a half mile or so to Little Pete's, swim across, or sit on the shore in your lawn chair and listen to Little Pete's bands. 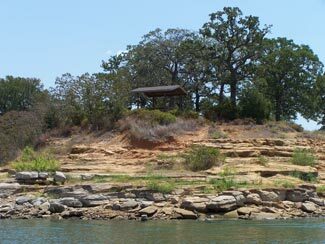 Read the Texas Outside review of Twin Coves in the Camping Section of Texas Outside. Twin Coves and their rocky shoreline around the cove is good for catfish and crappie. Fishing is good for crappie, spotted bass, and catfish and excellent for largemouth and white bass. Grapevine Lake has many dropoffs and underwater structure changes that hold largemouth bass. Rocky shorelines and boathouses are also good spots for largemouth bass. The water intake near the dam has a air injection area that attracts white bass. 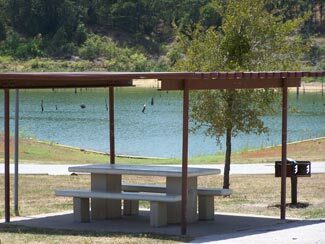 There are three excellent hike and bike trails on Grapevine Lake, the best known is Northshore. This 9 mile trail wanders in and out of the trees and winds along the shoreline. It is outstanding for mountain biking, very popular, and parts are technically very challenging. You will also enjoy hiking this trail. We love to bike the trail starting at Rockledge Park and stop at Little Pete's for lunch, appetizers, and live music on their deck on the water. The burgers are some of the best in Dallas! You may find it hard to get motivated to getting back on the bike after spending a few hours here. 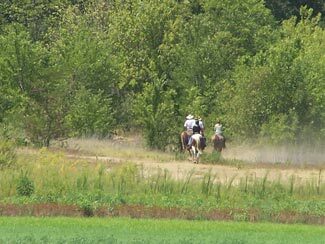 Two of the Grapevine Lake trails, Rockypoint and Crosstimbers are hiking and equestrian trails. You can learn more about the trails by clicking here -- make sure that you click on the trail name to get a little more detail on the trails. There is plenty to see and do around Grapevine Lake. You can explore the quaint shops in downtown Grapevine, shop at Grapevine Mills Mall, or any of the other nearby towns. Discover Texas can help you find other nearby outdoor activities and fun things. There is a paintball field at the dam if you like paintball. Lots of good restaurants are also nearby -- if you like country music and chicken fried chicken/steak try Love & War in Texas at Grapevine Mills Mall. 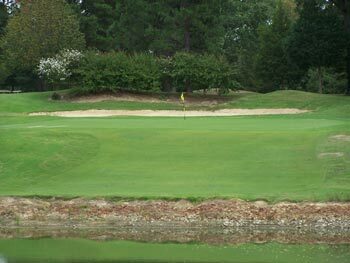 If you enjoy golf, Cowboys Golf Club and Grapevine Golf Course are both on the other side of the dam -- read a review of each of them and find some other nearby courses to play. Click here to see more pictures of Grapevine Lake.